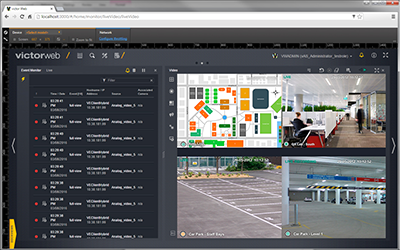 License management for VideoEdge NVRs has been streamlined within victor 4.9 with a new centralized licensing option, greatly reducing the time installers spend updating system licenses. Using the victor Application Server License Manager, administrators can conveniently and easily assign and reallocate licenses for cameras and analytics throughout the entire enterprise system from a single license file. VideoEdge now automatically configures and optimizes second stream video transmission to reduce bandwidth usage within victor for streams displayed on mobile devices or other constrained environments. This also enables motion detection to be configured automatically out of the box. Automatic motion detection enables Smart Search capabilities and Smart Streaming so users will always have these capabilities available to them without additional setup. Additionally, VideoEdge offers video analytics support for Illustra Pro IP mini-dome cameras. Push to talk audio allows an operator to transmit an audio message recorded on their victor client to one or more VideoEdge NVRs on the network for output on a public address system. This new feature gives administrators the capability to deliver critical communications during time-sensitive events more quickly and to a wider audience. Among the key features added to this latest version of victor web is Personnel Activity Monitoring, which monitors system admits and rejects in real time. The easy-to-navigate interface enables administrators to easily view and edit personnel-related credentials and clearances. Cardholder images can be displayed based on granted or rejected access or other events for easier investigations or reporting. System-wide health monitoring that tracks real-time recording, streaming and information processing data for all connected devices from any supported browser. Use of optional dashboards enable users to avoid outages and quickly identify system issues such as CPU usage, disk usage, network usage, connected cameras per recorder and current firmware version. Interactive maps that can be imported from victor Client for intuitive system navigation. A virtual PTZ function that offers users the ability to select a fixed camera view and zoom in to view greater detail in a specific area. Extended retail and business information reporting options give users greater insight into key areas such as store performance, building access and more. For more information on the victor 4.9 Video Management System, visit www.americandynamics.net.